Believing Thomas: Baseball, Chip Kelly, and God...not in that order. Baseball, Chip Kelly, and God...not in that order. It’s probably true that football is the new American pastime, but baseball continues to hold a special place in my heart. Maybe it’s the sounds of summer; perhaps it was the times spent making “Ken Griffey Jr.” catches over my shoulder from fly balls thrown by dad. 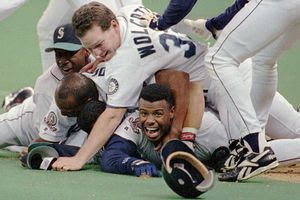 The 1995 playoffs when the M’s sent the Yankees home packing definitely is part of the equation. Here’s another reason I like baseball (which is also a reason why many people hate baseball): there is no time limit. The shortest 9-inning game in Major League Baseball history was 51 minutes. The longest 9-inning game was 4 hours and 45 minutes. The longest extra-inning game went 26 innings when in 1920, Brooklyn and Boston played to a 1-1 tie before the game was called due to darkness (no stadium lights). The longest overall game time was 8 hours and 6 minutes in 1984, in a 25-inning game between the Chicago White Sox and Milwaukee Brewers. They had to stop playing at 1:00am and pick it up the next day. NFL games get 60 minutes of game time; NBA, 48 minutes. Baseball? It’s anybody’s guess. Baseball is the anti-Chip Kelly: patient, slow – a methodical chess match between pitcher and batter, over and over again. 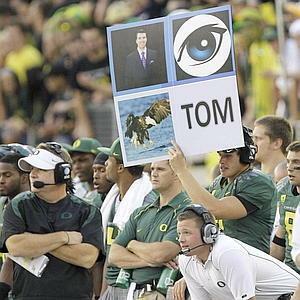 In 2011, the Ducks football team scored .77 points per game minute. If they had played a game that lasted 8 hours and 6 minutes they would have scored over 374 points! My seminary professor, Jim Nestingen, said, “Baseball is baseball when you don’t know what time it is.” Baseball has God’s sense of timing. None of us knows how long the game of life will last. And although life is full of moments that get the blood pumping, most of our days spent are quite ordinary, perhaps even methodical at times. Yet any pitch can turn the course of the game in dramatic fashion. In the fullness of time, God sent his Son into our world; in the fullness of time, the Gospel finds its way to our hearts. One of the fruits of the Spirit is patience – a fruit that seems more and more rotten in our culture of instant-access and instant-gratification. Someone wise once told me, “If God wants to grow squash, he’ll take a couple of months, but if God wants to grow an oak tree, he’ll take decades.” You and I have been created from an eternal perspective. Christians are Easter people who would follow the One who sprang from the grave. God grant us patience, focus, and endurance in service, for the next pitch could very well be a game changer. How about you? When has God's timing been difficult to accept?